Advantages: Packed with attractive profiles; many and varied colours and markings across all Jaguar PR variants; logically organised by national service; detailed and useful captions describing ops, colours, markings and unusual features; includes colour reference photographs; specific references cited; great source of inspiration for modellers. The latest release in the Aviation Workshop Profiles series is SEPECAT Jaguar in Worldwide Service by Glenn Sands. The book is illustrated by Jon Freeman. In common with earlier titles in the series, this 56 page soft-cover book is crammed full of artwork of the subject - in this case SEPECAT Jaguars - in all variants from the prototype onward in the service of Britain, France and worldwide Air Forces. Many of the aircraft are depicted in four-view diagrams on a full page. Jon Freeman's artwork will already be familiar to many of HyperScale's visitors, and his work here is clean, clear and very attractive. Captions accompanying the profiles are excellent, covering colours, markings, operations and references to photos. This is especially useful to modellers, as the artwork will provide the inspiration; but a photo will identify a myriad of minutiae. 33 full-colour reference photos of some of the most striking schemes in worldwide service are also scattered throughout the book. The book is logically structured by operators. The first section focuses on the Jaguar in RAF service, including 9 profiles of pink Desert Storm aircraft, and a single grey Operation Telic example. All RAF schemes are covered, from disruptive camouflage to greys to overall black, including temporary and winter finishes. These RAF schemes take up 30 pages. Next is the Armee de l'Air covering European and North African colours, and some spectacular special schemes. India, Oman, Nigeria and Ecuador round out the book with yet more colourful schemes and markings. Model Alliance has already released a decal sheet to tie-in with this title. The "On Target Profiles" series has demonstrated a proven formula for delivering a wide selection of interesting camouflage information in an attractive and compact format. 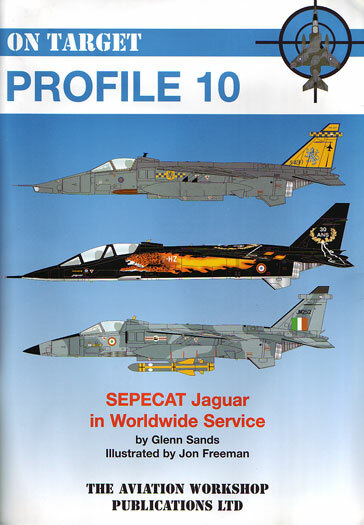 On Target Profiles 10, "SEPECAT Jaguar in Worldwide Service" is a terrific title that will provide plenty of inspiration for modellers, and also specifically points the reader to more photos and information. The separate availability of decals from Model Alliance for some of the most interesting subjects is a real bonus too.